Tuesday already. Hooray! Only 3 work days left until my 3 day weekend. I have plenty of projects but before I get to those, just a quick update on my nephew. I talked with his grandma and she seems confident that both boys will be able to stay with grandpa unless something happens to grandpa's health. School started today and we will soon see if my nephew is able to keep up with his school work with everything else going on. His aunt and uncle live 3 miles away and they will continue to help out. So, I will stay on my mortgage repayment path for the time being and also make cleaning and getting rid of stuff more of a priority just in case I need to change my living arrangements quickly. The weather is still hot here but October should cool down enough to go out to my property and start the clean up. 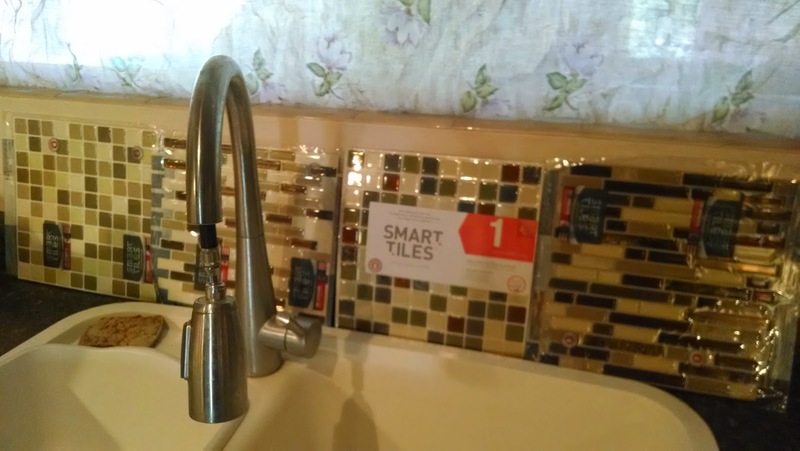 Last week, after I found out Home Depot didn't carry them in the store, I decided to order some Smart Tiles for the bathroom. I got some extra for the kitchen too but I'm not sure if I like them yet. Sorry, the lighting is very bad. I think my light fixture has one good bulb left. I can't wait until I can get that fixture replaces. It is #1 on my list. 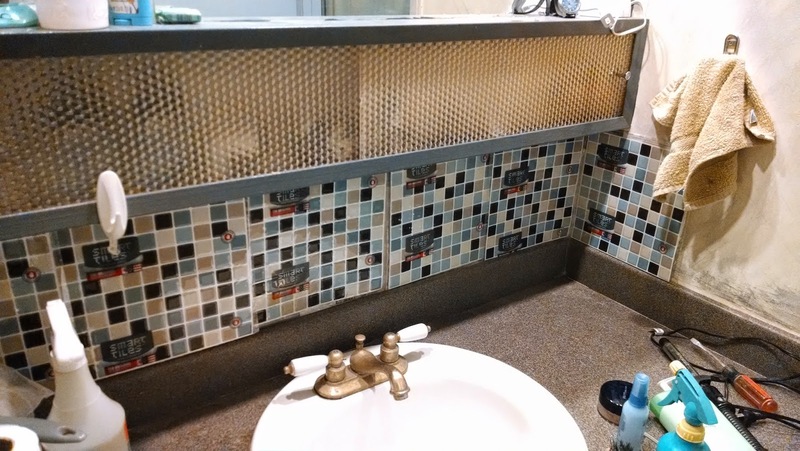 I didn't like the squares but this rectangular one looked ok. As you can see, I was also trying out laminate flooring as a backsplash idea. It was too dark for the kitchen. I picked these blue squares for the bathroom. I like them but the ugly 70's metal cabinet with yellowing plastic doors is throwing off the whole design. I am either going to cover it and replace the doors or remove it and put a shelf there instead. I'll need to add some storage somewhere else. 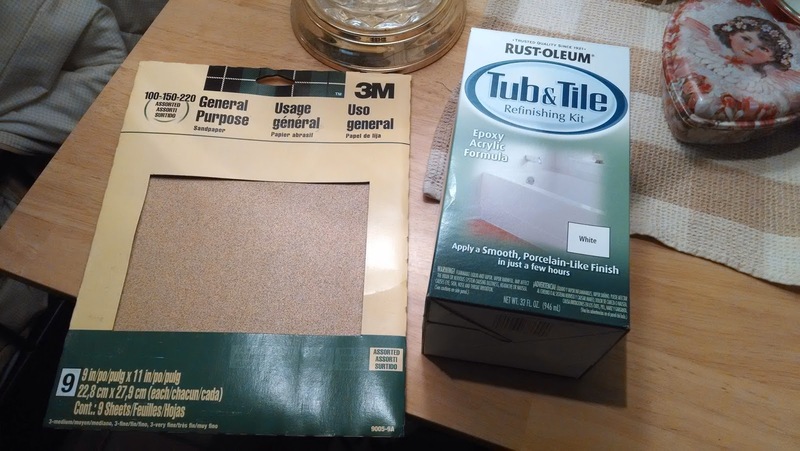 I also ordered tile paint and sandpaper for refinishing the bottom of the shower. I tried vinegar and bleach and later, muriatic acid to try and clean the grout but it is pitted and hopeless. I'm not looking forward to sanding. Maybe I'll go back to painting the walls again. I never got very far with that project. I'm excited to actually have the tiles. They look much bigger online. I'll end up taking some back and ordering more of the ones I like. Maybe this will be the incentive I need to continue my bathroom remodel. 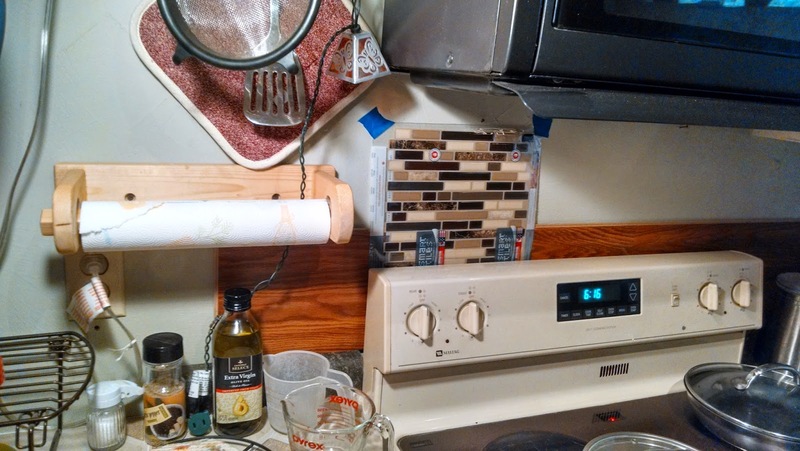 I can't use the tiles until I finish painting and decide what to to with the cabinet. If I keep working on it I will get it done. Take out the plastic? glass? doors and spray paint them with a frosting paint. I think you'll like the modern look and privacy that the frosting will provide. Thanks for the ideas, Paula! The former residents painted the cabinet blue with a latex paint, I think. I put an oil air freshener on it and it peeled off a large area of paint. Now it looks even worse. The doors are plastic. That is a good idea to paint them if I can get them off without breaking them. 70's plastic is kind of brittle.